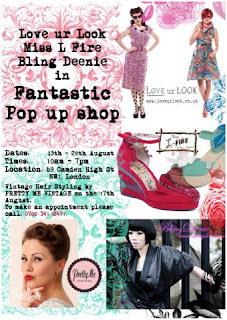 Love Ur Look, who have previously popped up in Forest Hill, are taking over the Camden Collective space on Camden High Street for a week in mid August, with help from friends Miss L Fire, Pretty Me Vintage, and Bling Deenie. Please support them! "Visit the latest pop up shop by Camden Collective from the 13th Aug - 20th Aug at 69 Camden High St London. With 1950s style dresses from Love ur Look, vintage style shoes by Miss L Fire and celebrity loved designs by Bling Deenie. On the 17th Pretty me Vintage will also be doing vintage hair styling!"